Whether you’re looking to lie on the beach and enjoy a low-key picnic lunch, spend a day at the winery or have a couples’ getaway with all the bells, whistles and glamping, the Mornington Peninsula is an ideal holiday destination for a day, a week or longer. It was a joyful discovery for me as a Melbourne resident (it took me less than 1.5 hours to get there along the Nepean Highway). For interstate and international visitors, it’s certainly a great opportunity to show off Victoria’s wineries, beaches, food and walking riches, all a short trip from Melbourne. If you’re not driving, there’s a bus from Melbourne and ferries to Phillip Island, French Island and Stony Point. The Visit Victoria website offers more advice on getting around. Pizza, smoothies and frozen yoghurt – oh my! The Mornington Peninsula has become a foodie’s wonderland, where you’ll find an abundance of cafes, restaurants and outdoor picnic venues to meet your every craving. While dining in is recommended, takeaway to eat by the beach on a warm day is hard to resist. There’s several cafes at the Peninsula Hot Springs, so you’ll be catered to if you want pizza and equally, if a low-carb, gluten-free salad appeals, that’s on offer too. If you opt for a glamping experience (more on that in the Stay section), there’s an on-site restaurant at nearby Blue Range Estate. In the beach town of Mornington itself, Store Fifteen offers nutritious smoothies, coffees, teas and an all-day breakfast menu with plenty of vegan, gluten-free and vegetarian options. There’s a range of juices (try the refreshing celery juice) and don’t miss its super-fresh salads. And while you’re here, it’s almost mandatory to eat frozen yoghurt. Drop into YOMG for the mango matcha frozen yoghurt or maybe the salted caramel is more your flavour? There’s a whole lot of juicy burger options if you’re ravenous too. If you’re after a side of fine dining with your wine tasting, you can’t go past a stop in at Pt Leo Estate. Aside from world-class wines, you’ll also find Laura; the restaurant named ‘New Restaurant of the Year’ in the Good Food Guide 2019. This two-hatted restaurant offers a fine-dining experience, headed up by Pt Leo Estate’s culinary director Phil Wood. If you’re after something a little less fancy, Pt Leo Estate Restaurant has only the one hat, but all the flavour. We especially recommend trying the snapper ceviche with avocado, coconut and chilli, and the John Dory, served with teriyaki sauce, mushroom XO and macadamias. From a sip perspective, you can’t go past a visit to Bass and Flinders Distillery in the Mornington Peninsula. Known for its impressive range of brandies and gins, it provides an attractive alternative to a weekend packed with wine tastings – especially if you’re willing to experiment with, erm… different flavours. Bass and Flinders is known for its innovative ideas, such as its ‘Angry Ant’ premium gin, created with the addition of an edible native ant: a gravel ant that has been foraged as a food source for centuries. Though it may sound slightly startling, the infusion of the gravel ant means that the gin is enhanced with a unique, slightly tangy flavour reminiscent of the Australian outback, which those who are brave enough to try it just love. Hand on heart. 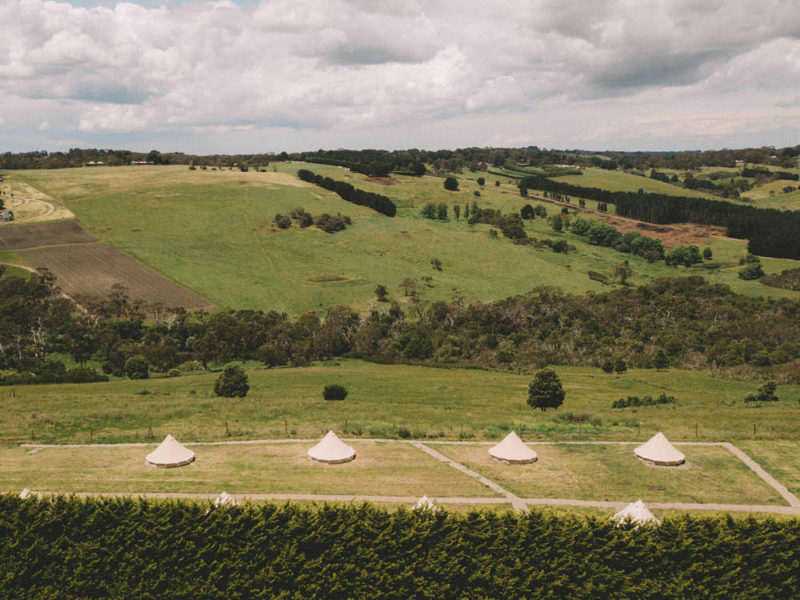 New to the accommodation offerings on the peninsula is Mornington Peninsula Glamping. The first glampsite to pop up on the peninsula, it’s located on the Blue Range Estate Winery, run by the Melone family. An adults-only retreat, each of the glamping tents accommodates two people maximum. Within the five-by-five-metre tents is a queen-size bed, two lounge chairs and a coffee table. You won’t need to go device-free either, with solar power to ensure you can remain connected if you desire. Within easy walking distance is a shared cooking and dining area (barbecues, hot water and boutique coffee and tea) plus bathroom facilities, which are just as snazzy and chic as the tents. Between Friday and Sunday, you can eat at the winery’s restaurant if embracing the great outdoors as your kitchen doesn’t appeal to you. If you’re planning a trip to the Mornington Peninsula, Jackalope undeniably needs to be a part of your itinerary – if not to stay, then to explore and appreciate. Not only a treat for those looking for a chic place to rest their head, it’s also a deservedly acknowledged spot for the art appreciators among us to explore, as the property houses boldly curated collaborations with incredible Australian designers – some inside, some in the form of sculptures scattered around the property’s vineyard foundation. Speaking of designers, 45 of the hotel’s ‘designer dens’ are furnished with custom-made interiors, and the hotel’s dining and drinking options are no exception to the strong art-themed decor. Flaggerdoot, Jackalope’s cocktail lounge is reminiscent of a science lab-turned penthouse, and Doot Doot Doot, the hotel’s signature restaurant will leave you floored with meals almost too beautiful to eat. For many seeking a retreat from daily life and the rejuvenating qualities of nature and water, the Peninsula Hot Springs provide much-needed respite. Choose from the pools or private baths, where natural thermal mineral waters soak tired muscles to heal and harmonise. Whether you come purely to indulge in the thermal pools or to spend an entire day, there’s plenty of choices available. The spa offers massage, facials and body scrubs. But, if you’ve got energy to burn and a curiosity about where you are, take the Indigenous cultural walk. Return in time to do the body clay ritual or take an exercise class in water. There’s two dining venues: both the outdoor cafe, offering gourmet pizza and the amphitheatre cafe where the focus is on healthy, locally harvested ingredients to deliver an organic, wholefood menu. Depending on your timing, you may be lucky enough to experience seasonal arts and entertainment on the nearby amphitheatre stage. The spa dreaming cafe is adults-only (over 16) and also focuses on nourishing and wholesome food. Fully licensed with complete table service. Mornington Botanical Rose Garden offers free entry to stroll through a garden of sculptures, gazebos and – naturally – roses of all description. There’s high tea on offer. Check the website for dates and times to book ahead. With many lovely beaches to choose from within the sheltered waters of Port Phillip Bay, Mother’s Beach in Mornington is definitely one where you can avoid big crowds, swim, walk the shores and get out a picnic if you’re so inclined. Nearby Shire Hall Beach is home to colourful huts, along with plentiful benches, picnic tables and toilets. Fossil Beach offers geologists and budding geologists a picturesque limestone cliff-lined walk. There’s a sign-posted walk that indicates sites of significance regarding the original Aboriginal inhabitants and the first European settlers. The beach is located within the Fossil Beach Geological Reserve. Further south between Mount Martha and Dromana, Safety Beach is another calm spot. I took a stroll along on it on weekday morning and it was relatively quiet. There was a buzz around the coffee van that sets up near a playground but apart from that, there’s some dog walkers, locals out for their usual walk and joggers. Walk all the way to the pier or stop and crack open a book as you sit and enjoy the ocean view. For wilder ocean beaches along the rugged, southern coastline of the peninsula, check out Sorrento Back Beach for bodyboarding, surfing and coastal walking; or Pt Leo Surf Beach for surfing, fishing and camping on the adjacent foreshore reserve. If you’ve never tried stand-up paddle boarding before, there’s beginner lessons with SUP Fit Mornington. You can organise individual lessons or groups with a focus on making it fun and inclusive. Their locations are varied, from Mount Eliza to McCrae and further out, but each within a half-hour drive of the other. Discover all the region has to offer with our extensive guide to the best of the Mornington Peninsula.